I am woken by the door bell being rung repeatedly, the same bell I had ignored on my first morning in Yerevan. Today, I scramble into t-shirt and trousers and answer the door, to find a small, severe, grey-haired woman, all handbags and narrow eyes, stood there. She speaks in tones equal to her appearance, first in Armenian, then in Russian, at which point I declare that I am English and, consequently, haven’t a clue. She takes my lack of understanding as a ploy, and not a very good ploy, and we are both talking across each other, she jabbing her finger at me, me lifting my shoulders and showing the palms of my hands, Larry David-style, when an elderly gentleman appears from across the hall and asks, in English, if I am English. He gives a wave of the hand, as if to say, leave all this to me, and picks up the thread with the old lady. After a few moments he reveals that she is a tax collector, which doesn’t surprise me in the slightest. If ever there was a woman who was purpose-built for scaring people into handing over their hard-earned, this was the woman. I give her a phone number, and she retreats down the stairs, displeased but, temporarily, defanged. I turn to the old man, suntanned, baldheaded, charming, and after exchanging names and handshakes, he says, “I am leaving Armenia…I have a brother in California…the Russians, they are coming…I remember the Soviet days, not good…they want to build another empire, they are too strong…we cannot stop them.” I agree in a noncommittal way (just in case there are any Russians lurking on the stairwell, taking notes), before we return to our respective flats. It is the suave old man from across the hall. He invites himself in and sits down delicately on the sofa. “You are tired, maybe?” he asks, and I deny it, although I can feel that my face is red and blotchy from sleep. I sit up, cross-legged on a chair and look attentively at him, in his old man summertime clobber of polo shirt, khaki trousers and tennis shoes. I look at him as if he is a character in a Graham Greene novel, which, given his vintage, isn’t impossible. “I am on holiday,” I say, which he ignores. I wonder if I should ask some questions about the type of smuggling he had in mind, and what the pay might be, but think better of it as it might encourage him, or, worse, make me laugh. Either way, I keep quiet. And with that, the elderly gentleman rises, shakes my hand, and leaves the flat. 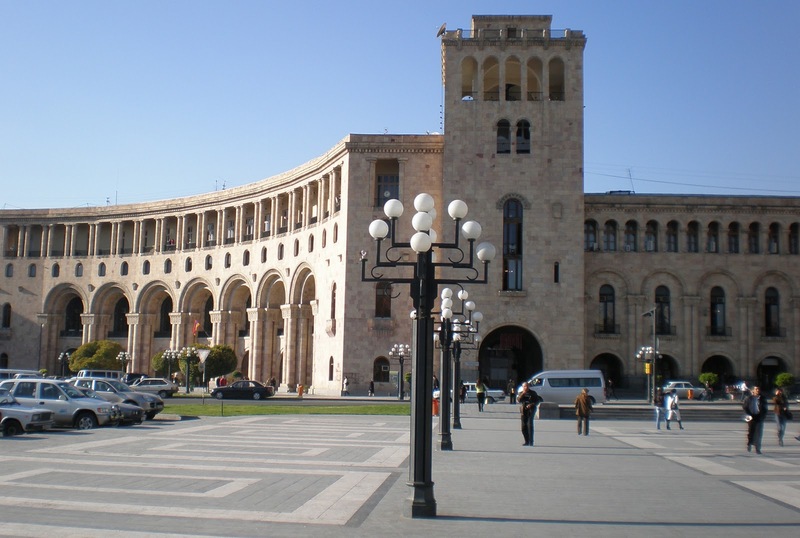 Yerevan’s lovely central square. My flat, me and my neighbour are just off to the right somewhere. Yerevan: if the Russians are coming they are coming for the brandy.